Employment concerns: Gowda says mining activities were providing employment to 100,000-150,000 people. Photo by Ramesh Pathania/Mint. New Delhi: D.V. 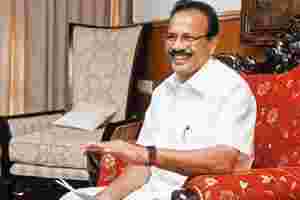 Sadananda Gowda became the chief minister of Karnataka after a tough competition from within his own Bharatiya Janata Party in August. And after allegations of corruption and illegal mining that brought down former chief minister B.S. Yeddyurappa and prompted the Supreme Court to ban mining, Gowda’s first role as head of a state started in difficult circumstances. As a former lawyer who once took up workers’ issues, how are you going to help jobless people in the mining areas? Practically, it is a challenge for the Karnataka government. Earlier, mining activities were providing employment to 100,000-150,000 people. But subsequently in the last 2-4 years, in the eyes of the people, mining has become bad and illegal mining has become an issue. Things that have happened earlier might have contributed to the present situation. For that reason we formed a new mining policy and we wrote to the Centre to ban exports of illegally mined ore. These were the initiatives we had taken. But unfortunately for the wrong reasons Karnataka is on the map of illegal mining. At this juncture where matters are pending in the Supreme Court, we are not in a position to comment. We are not in any position to do anything with the central empowered committee reports and the Lokayukta (ombudsman) report on one side and the Supreme Court matter on the other side. So it has become very difficult for us to come out with any clear steps so as to give some sort of employment generation. After the dust settles and the court gives its verdict, how do you expect the mining industry to be like? The central government has come out with its new mining policy (Mines and Mineral Development and Regulation Bill). Cabinet has approved it but it will take some time to be implemented because after presentation in Parliament, the committees where matters have to be discussed have to come out with their own proposal. Till then, I don’t know what will be the verdict of the Supreme Court. But we are thinking whether we can move the Supreme Court so that some employment creation and other things can be done. We are planning to see that environmental concerns are addressed and we are thinking can we request the Supreme Court for permission to issue new mining leases for captive use of value-added factories (steel plants such as Posco and ArcelorMittal that have memorandums of understanding with the state) that has to be established in Karnataka, thereby creating new jobs. That is what we are thinking. But we have not come to a conclusion so far as to what are the steps that have to be taken immediately. When you say you plan to request the Supreme Court, do you mean you will file a petition? We are thinking. We have to wait for some time, then only we have to come out with a clear proposal. That is the only alternative left for us. We can’t do anything until and unless the Supreme Court permits us to go ahead with certain things. When will your own committee on environmental impact assessment submit its report? Within a month I will get that report. Supreme Court has observed very severely the environmental collapse that has happened in Bellary, Chitradurga and a portion of Tumkur. It is the responsibility of the state government to take care of all those things. So we are at it. What will the next step be after getting the environment impact assessment? Only after that report we can go to the Supreme Court stating that these are the plans and programmes we are making and that there will not be any environmental pollution. So give us some permission to carry out something for the established industry. For that reason you give us some relaxation. It is the request we intend to make. So far, we have not made any such preparations but we are intending to go in that line. Will the central government’s new mining Bill be favourable to your state? I hope so. Because as far as ad valorem and all the taxes are concerned, the government may get more revenue owing to the provisions of the Act, which will also have plans for local development. Do you think Posco and ArcelorMittal might find it difficult to set up their projects because there is less iron ore and the new mining Bill makes it expensive for them to operate? NMDC (National Mineral Development Corp.) is the only mine that is working. JSW and other plants are finding it very difficult to find supplies. I think the Supreme Court will certainly come up with clear directions so that the mines that are available in the state, they should be utilized for the benefit of the state and the creation of employment. I hope that certainly we will come up with a solution. And will it still make business sense for Posco and ArcelorMittal and other steel companies to set up plants in Karnataka? Yes. Only for the time being the matter is pending with the Supreme Court so it has become little bit difficult for us. I hope that the court will come up with a clear verdict in favour of the Karnataka people.